Dave's Services A/C & Heating is proud to serve the Piqua community! The service provided was fine. I felt it was a tad expensive for a half hour's work ($240.00). Also I told the receptionist that someone had cut my AC wire. She put that I (the customer) cut the wire. Why would I vandalize my own air conditioner... But I cannot complain about the professionalism and work. Dave's Service is the greatest. Very good service, I would recommend them to anyone. Great customer service. Most companies these days don't have that anymore. The people that work there know what they are doing. Great company !!!!!!!!!!!!!!! Fast service. Very friendly and knowledgeable staff. About Piqua, OH - Happy to be your hometown Heating & Air Conditioning Contractor! 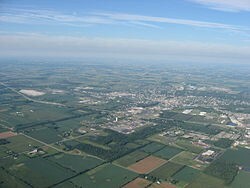 Piqua is located in Miami County, Ohio. With a population around 20,000, it is the perfect sized town for those who enjoy privacy and a small town atmosphere. This lovely community is absolutely beautiful and filled with warm breezes and flowers blooming in the spring and summer. Then, fall and winter roll in with autumn leaves and crystal white snow. The seasonal weather creates a sense that you can enjoy a bit of everything - from swimming to snowball fights and everything in between! For the outdoor enthusiast, there is an absolute plethora of fun activities in the area. Looking to enjoy nature while fishing, hunting, hiking and more? That’s NO problem! Nearby State Parks include: Lake Loramie, Kiser Lake, Indian Lake, and Grand Lake St Mary’s. In the warm summer months, there is a great deal to do around the water such as swimming, fishing, boating and more. In the winter, enjoy the spectacular vistas and the lovely white landscapes of ice and snow. In the spring, go for a hike and bear witness as nature surfaces and comes alive to enjoy the sunshine. There is something in every season to do with the family! In Piqua itself, there is the Taste of The Arts held each year in May and Christmas on The Green is held each winter. There is also The Piqua Heritage Festival, an annual event at the site of the Col. John Johnston farm, held on Labor Day weekend. In addition, the annual Country Concert is held in nearby Newport, Ohio each year in the heat of July. Lots of famous national stars grace the stage each year and the event attracts people from all over each year. During the fall season, the adjacent town of Sidney builds a huge corn maze which is wholesome fun for the whole family. Every season, every age, every interest. This part of the world has you covered.